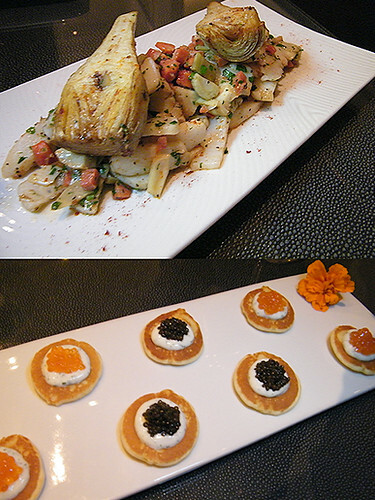 Petrossian Restaurant has been on my “to do” list for quite a while, and thanks to the money-saving motivation of “Dine LA Restaurant Week”, I finally got my first taste a few days ago. Dinner was just $44 for three courses (each), but Peter and I ended up trying a few more dishes (compliments of manager Christopher Klapp and chef Benjamin Bailly). In the end we shared NINE courses (dessert included) and a lovely bottle of Malbec that our server recommended. 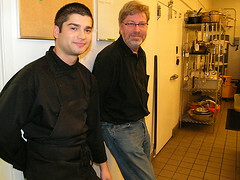 When chef Bailly first came to our table, I mistakenly thought he was another young server. At just 27 years old, he’s been running Petrossian’s kitchen for the past six months. His previous jobs included: Sous Chef at L’Atelier de Joel Robuchon in Las Vegas, Chef de Partie at Robuchon Paris, and Commis de Cuisine in the Monaco Robuchon outpost. 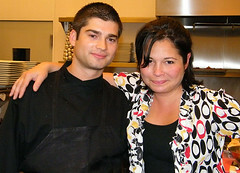 Now I have to say, that is some serious kitchen experience supporting this French chef’s sculpted and gorgeous face! After our fantastic meal, Chef Bailly took us on a tour of the kitchen, then a quick browse through the gourmet boutique where we met his equally gorgeous girlfriend, Anna. It turns out it was the chef’s night off, and he came in specifically to say hello. Did I mention that he’s not only talented and handsome, but generous and sweet too? 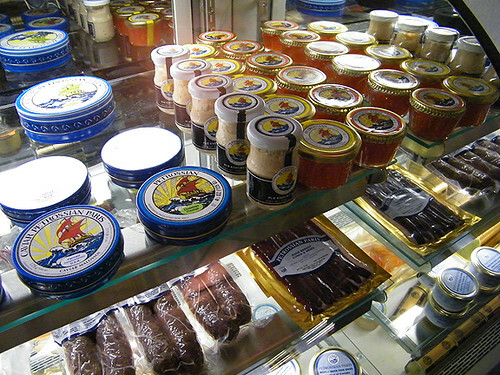 Boutique: They not only sell the world’s best caviar but also smoked fish, foie gras, truffles, chocolates, candies and much more. 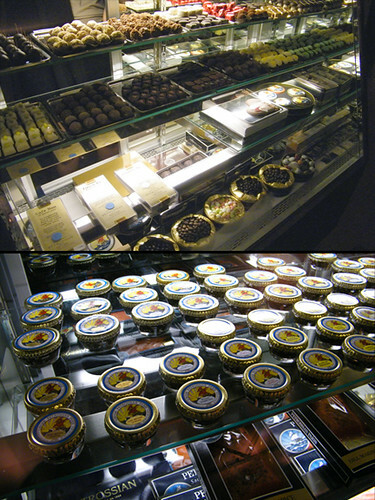 We went home with a box of sweets and a hankering to return to Petrossian very soon! 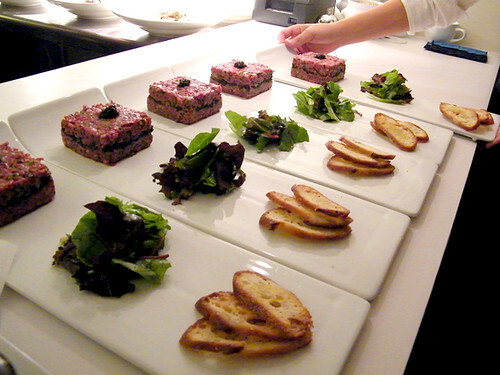 Update: Visit #2 to Petrossian on 10/12/09 I loved it so much I gathered a group to eat there a few days later! Thank you thank you thank you for trying this and blogging about it so quickly! It looks so amazing. Petrossian was tentatively on my to-do list, and now it has moved up to my to-do tonight list. I am serious! That looks delicious. 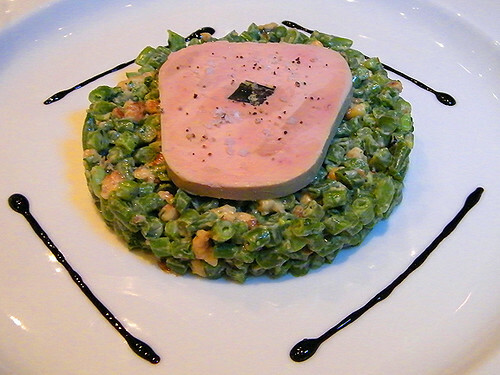 The foie salad looks as though it is foie terrine, yes? And the only thing I am sad to miss is the calamari, I love squid. Hope you enjoy it as much as I do. Cheers! Really great stuff here, Jo. I’ll admit it was hard to not lick the screen. Fois and Caviar everywhere! The display case would have melted serious plastic in my wallet. 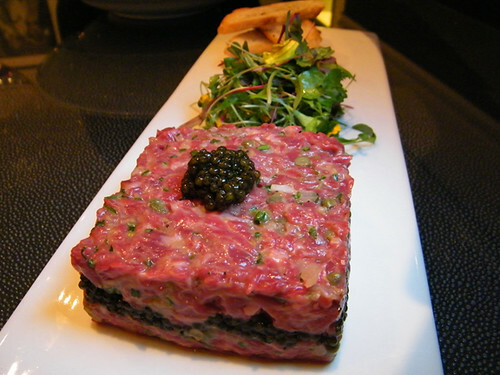 Does it get any better than a chef who manages multiple uses of caviar and finds new things to do with fois gras? 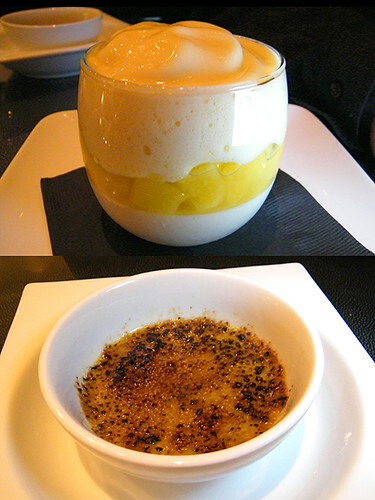 Creme Brulee? You so have to love that idea. It’s obvious he cut his teeth in some pretty heady kitchens. Seems like a moderately priced outing too. $44 for 3 courses, and the food was of this caliber? That’s incredible. When are you and Kat moving to L.A. so we can eat together more often??????????? That would be simply heaven. 🙂 Hey, where have I heard that before? Oh girl, you make me soooo jealous. seriously. 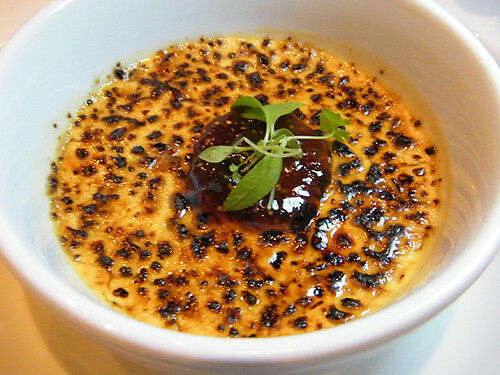 Wow, you had me at foie gras creme brulee! The food looks fantastic! I can’t wait to check it out. 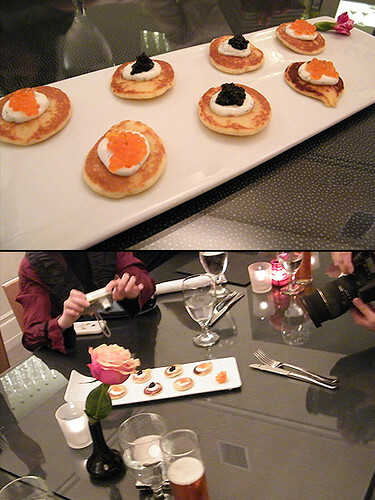 I want those little blinis and a few bowls of that creme brulee. The mac and cheese sounds good too. Me hongry. Oh shoot…I better make my reservation soon! 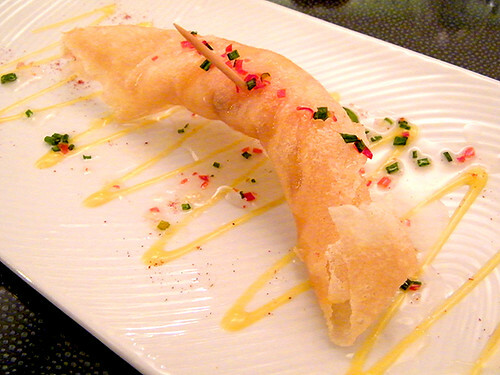 so many TASTY things NOT on the DineLA menu as well… I tried the Crispy Shrimp “Papillotte” last night… OMG. GORGEOUS photos! 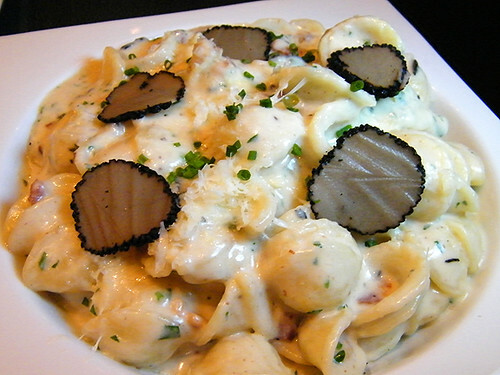 That truffle mac ‘n cheese looks positively stunning! Sounds perfect on a rainy day like today. Oh wow! How did I miss this post??? Every dish on this post looks amazing! 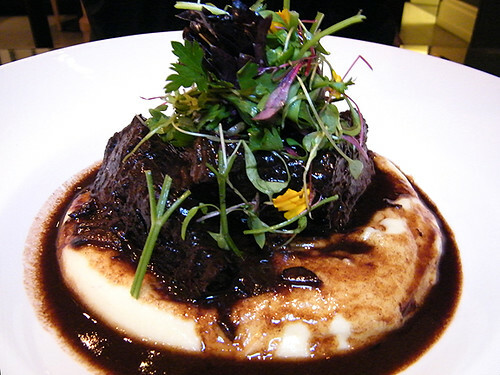 The Black Truffle Mac & Cheese, the Braised Short Ribs, Tartare, and all look so yummy. I so wish I lived closer to you, so I can regularly dine with you. Have to put this one on the list!!! It’s AWESOME. Wished you lived closer too! 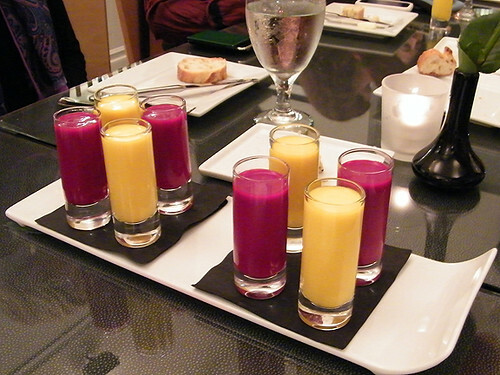 thanks for your review – based on this we had a amazing meal last night. In addition to the great items you highlighted above, we loved the mushroom cappuccino. 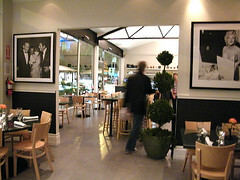 A great DINELA discovery, but I would go back even without that menu. Brian, I’m so glad you enjoyed it! I’m emailing Chef Bailly now. Cheers! 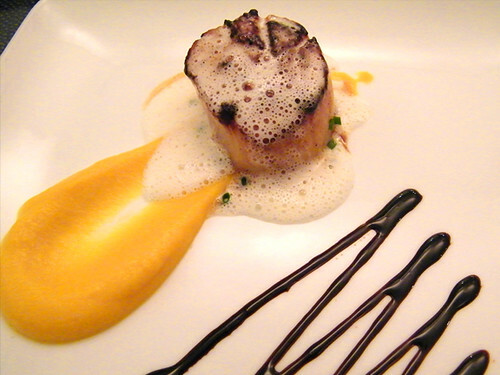 I stopped going to restaurant week in NY because most restaurants dumb down the menu for that week. They just give you a choice of chicken breast, steak, or salmon. It’s boring and not representative of what the chef of the restaurant usually does. I guess this is my very long winded way of saying, I’m so jealous that your restaurant week in LA looks quite fabulous with beautiful and interesting dishes. =( Just saw some cheap flights so I could be back soon. 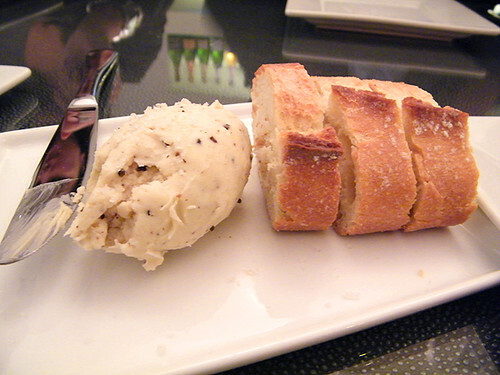 I did try out a few other DineLA dinners that were “dumbed down”, but I won’t be blogging about THOSE! Just the good stuff! Late to this review but that all looks ridiculously good! Why have I put off Petrossian for so long?! I must rectify that soon.